Bart, short for Bartholomew, became a resident of Out of Africa in 2008. He moved into his new sloth exhibit in 2016, allowing visitors the opportunity to see him more closely. He really enjoys the new home, especially the two hammocks we built for him. Like all sloths, Bart is nocturnal. Sleeping or lethargic during the day, he comes to life at night, as evidenced by the food scraps he scatters around every corner of his house. Those doing a sloth encounter need not worry that Bart will sleep through the experience. Once he smells his favorite food, tofu, he doesn’t care what time of day it is. You’ve got his attention! Linnaeus’s two-toed sloth, also known as the southern two-toed sloth, unau, or Linne’s two-toed sloth, is a species of sloth from South America. These nocturnal tree-dwellers spend their lives in tropical rain forests and cloud forests. 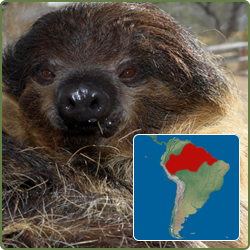 Their range includes Venezuela, the Guianas, Peru, Colombia, Ecuador, and Brazil north of the Amazon River. Recent evidence suggests the species’ range even expands to Bolivia. The sloth’s head is short and flat, with a snub nose, rudimentary ears, and large eyes. They possess a short, fine undercoat and an overcoat of longer, coarser hairs, which turn green in moist conditions due to algae growth. This greenish tint camouflages them in the forest canopy. Their fur also harbors moths, ticks, and beetles. Unlike most animals, the sloth’s fur is parted on the belly and curves across the back, allowing rain to run off. Sloths range in size from 21 to 29 inches. They weigh between 9 and 18 pounds when fully grown. As its name suggests, the two-toed sloth has two claws on each forelimb, while their hind feet have three toes with hook-like claws. These claws measure 3 to 4 inches long, perfect for hanging onto tree branches and grabbing leaves and shoots to eat. Because sloths are so light weight, they can feed in high, narrow branches that won’t support other animals, like jaguars and ocelots—predators of the sloth. Sloths are nearsighted, relying little on vision to carry out normal patterns of behavior. They also have poor hearing. However, they have a great sense of smell thanks to extremely well-developed olfactory bulbs. At first glance the sloth may seem slow and lazy; however, their usual idleness is due to metabolic adaptations for conserving energy. (Their metabolic rate is 40 to 45% of that expected for a mammal of their size.) Leaves, their main food source, provide very little energy or nutrients, and do not digest easily. Sloths, therefore, have large, specialized, slow-acting stomachs with four chambers in which symbiotic bacteria break down the tough leaves. As much as two-thirds of a well-fed sloth’s body weight consists of the contents of its stomach, and the digestive process can take as long as a month. Sloths also maintain low body temperatures when active (86 to 93 °F) and still lower temperatures when resting. If a sloth’s body temperature drops too low, the digestive bacteria in its gut can stop working, and the sloth can starve to death even with a full stomach. Linnaeus’s two-toed sloth live between 15 and 20 years in the wild, but they can reach over 30 years in captivity with good care. Males reach sexual maturity between 4 and 5 years of age, females at 3 years. Two-toed sloths have a gestation period of about 6 months. The female gives birth to a single offspring while hanging upside down. A well-developed baby sloth is about 10 inches long and weighs 12 to 16 ounces. The baby clings to the mother’s belly for five weeks, until it is strong enough to move on its own. Mothers spend a lot of time and energy feeding and caring for their young, both before and after they are weaned. The young can hang upside down within 20 to 25 days but continue to nurse for the first 5 months of life. They may associate with their mothers for the first 2 years before setting out on their own in their rainforest home. While females gather together periodically, males remain solitary. The sloth is the world’s slowest mammal. It is so sedentary that algae grows on its furry coat. These arboreal creatures spend virtually their entire lives upside down in the trees. They eat, sleep, mate, and even give birth hanging on branches. About once a week they descend to the forest floor to urinate and defecate. Sloths often remain motionless, even when awake. Their slow movement helps to avoid detection. They sleep 15 to 18 hours a day and wake during the night only to feed. When sleeping, sloths often curl up into a ball in the fork of a tree. Well-suited for life in trees, sloths are quite awkward on the ground. Their weak hind legs provide no power, and their long claws are a hindrance. They must dig into the earth with their front claws and use their strong front arms to pull themselves along, dragging their bellies across the ground. If caught on land, they have no chance to evade predators and must try to defend themselves by clawing and biting. Though they couldn’t be clumsier on land, sloths are surprisingly good swimmers. They sometimes fall directly from rainforest trees into rivers and breaststroke efficiently with their long arms. At night sloths eat leaves, shoots, small twigs, vegetation, and fruit from the trees. They get almost all of their water from juicy plants. In captivity, sloths eat a high vegetation diet including kale, corn, apples, leaf eater biscuits, bananas, sweet potatoes, carrots, and Bart’s all-time favorite, tofu. The two-toed sloth is larger and faster than the three-toed sloth. They have the lowest muscle mass relative to overall body weight of any animal, to the extent they can’t even shiver to stay warm. Organs such as heart, liver, and spleen are located differently than other animals to accommodate their upside-down lifestyle. Sloths have a powerful grip, using their long claws like a safety harness. Even after a sloth dies, it sometimes remains hanging in the trees with its death grip. Least concern. Threats to populations include habitat destruction and hunting for their meat, fur, and claws. Because of their slow nature, sloths are frequently hit by cars in places where roads have been cut through the forest.